Working agency-side for Oliver Marketing Group I created emails for Starbucks across 7 primary markets, working closely with the transcreation team to create global campaigns that are relevant to local markets. I designed gifs, illustrations and interactive email campaigns as well as assets for the My Starbucks Rewards Mobile App. I also worked closely with the Art Director on tactical briefs, ad hoc campaign work and conceptual work for Social Media Campaigns. Above: Christmas 2017 First Taste Cold Brew and LTO's Email, adapted for 7 markets, eg. Austrian German, Swiss French. Design includes an animated gif and an inbox preview for My Starbucks Rewards App users. Above: The illustrations on this poster were created by me, this was then mocked up into a poster for the Starbucks x Neighbourly Cheer for Good Campaign. This illustration also features on the Starbucks website as a digital asset. 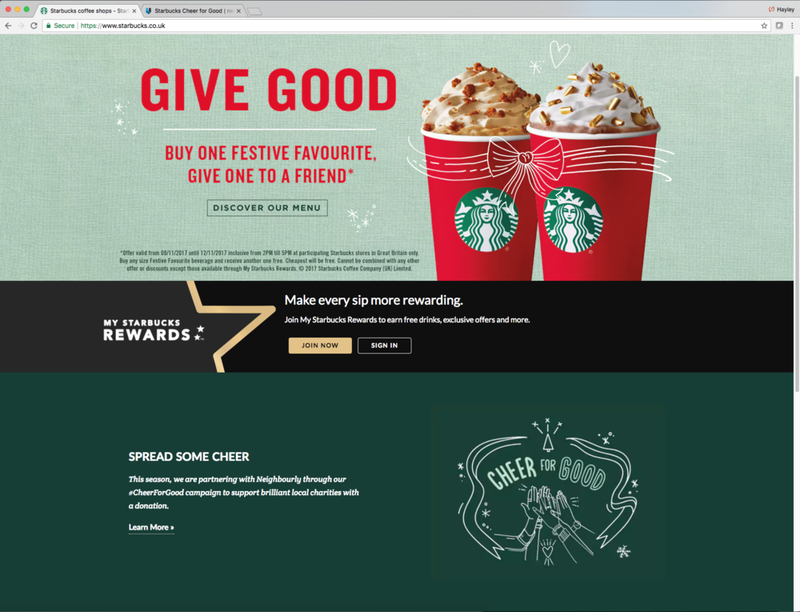 Above: GIFs created for My Starbucks Rewards Christmas Campaigns.